Lynn Wolf - Education Resources, Inc.
Robin Glass, MS, OTR, IBCLC and Lynn Wolf, MOT, OTR, IBCLC practice occupational therapy at Seattle Children's Hospital in Seattle, WA. Their clinical specialty is the treatment of infants, both as hospital inpatients and outpatients with a strong focus on feeding issues. They are NDT trained and Board Certified Lactation Consultants, with extensive national and international experience speaking about the infant feeding. Both hold clinical faculty appointments at the University of Washington. Ms. Glass and Ms. Wolf have authored numerous journal articles as well as the book Feeding and Swallowing Disorders in Infancy: Assessment and Management. They were recipients of the National Association of Neonatal Therapists (NANT) Pioneer Award in 2015. 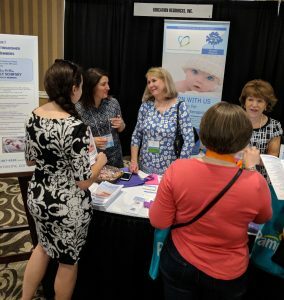 Lynn joined ERI at the NANT 8 conference in Charlotte NC 2018, and spent time sharing her expertise. Disclosures: Financial: Lynn Wolf receives a speaking honorarium from Education Resources, Inc. and royalties from Hamill Institute on Disabilities. Non-Financial: Lynn Wolf is a clinical faculty member of University of Washington, and is on the Pediatric Feeding Association Steering Committee. Financial: Robin Glass receives a speaking honorarium from Education Resources, Inc. and royalties from Hamill Institute on Disabilities. Non-Financial: Robin Glass is a clinical faculty member of University of Washington, and is on the Pediatric Feeding Association Steering Committee.